Using yoga for sciatica may not be the first thing that springs to mind when looking for sciatic nerve relief. Nonetheless, it’s one of the best preventative measures you can take to help ensure sciatic pain does not become debilitating. A well-balanced yoga practice that includes specific sciatica exercises for the spine involves maneuvering the spine into six movements: flexing, extending, lateral flexing to the right and left, and twisting motions to the right and left. These flexing and twisting motions of the spine make for excellent sciatica stretches that help the muscles loosen up and become more limber, and can even help the nerves become untwisted. It takes years of sitting and being physically inactive in particular ways for nerves to bundle up and create a sciatic issue (1). Sciatica is a word used to describe a collection of symptoms that involve the sciatic nerve. 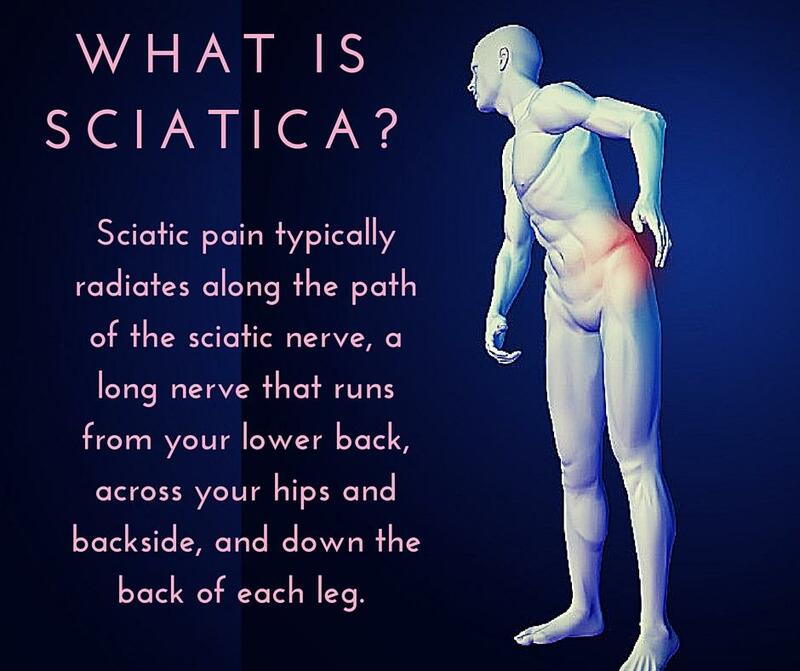 It isn’t actually a true diagnosis itself because sciatica can include a number of issues, including a pinched nerve, piriformis syndrome (in which the piriformis muscle tightens up), spinal stenosis (a narrowing of the spinal canal), a herniated disk, or a slipped vertebrae. Sciatica almost always involves a nerve being compressed, and this is what causes the pain (2). Sciatic pain typically radiates along the path of the sciatic nerve, a long nerve that runs from your lower back, across your hips and backside, and down the back of each leg. In most cases, sciatica affects only one side of your body. The nerve damage can cause inflammation, pain, and sometimes numbness in the affected leg. If this happens, visit your doctor to ensure it isn’t something more serious. Although the pain associated with sciatica can be severe and requires heavy medications to relieve the pain associated with the nerve damage and impingement, surgery is usually not necessary. Only those who have severe sciatica that causes leg weakness, numbness, and even paralysis, or who have bowel or bladder changes (such as incontinence) are likelier candidates for surgery. Constant pain in one side of the backside or leg. It’s rare to feel it in both legs. The pain you feel can be described as burning, tingling, or searing; it’s not usually a dull ache. There is more pain when you sit. You have trouble moving the leg or foot, and there is weakness in the limb. It’s difficult to stand up or walk because of sharp pain. Exercises for sciatica during yoga practice heavily involve the spine and aim to develop space between the vertebrae. Sedentary lifestyles, gravity, genetics, and age all contribute to spinal issues and compression, and yoga helps us extend the spine (and many other areas of the body) through moving, twisting, and flexing (4). Yoga moves help the vertebral discs and increases strength and agility to the muscles, tendons, and ligaments which all support the vertebral column. Practicing yoga regularly, twice a week even at 30 minutes, can greatly improve sciatic issues by making the muscles and spine more limber and less stressed. Many factors contribute to sciatica, and though you may not be able to change your job to one that involves less sitting or change the fact that you are aging, you can control your weight and activity level. Incorporate yoga for sciatica relief into your weekly activity schedule and you will surely notice benefits. Forget the fancy moves you see some people doing when practicing yoga. Yoga isn’t all about doing awkwardly positioned handstands and one-legged posture stances; it involves many easy, simple moves that most people can do while sitting or standing. Not only will your spine thank you, but yoga has also been shown to lower blood pressure and improve mood and sleep. Below are six uncomplicated yoga moves you can do at home to help relieve sciatica. You don’t need a yoga mat, but it certainly helps (5). This is an easy move and it feels wonderful on the back because it provides a great stretch. The pose: Get on your hands and knees. Pull your lower back down and lift your chest by pulling your shoulders back. Hold for 10 seconds, but remember to breathe in and out through your nose. Return to a flat back. Then tuck your chin into your chest and arch your back. Hold for 10 seconds again and then release. Do this for a minute or two. It’s important to do both the flat back and curved back positions because they balance each other out. This pose is favored by most yogis because it has a calming effect on the body and mind. The pose: Get down on the floor on all fours. Extend your arms out in front of you and drop your hips to the floor so that your chest is resting on the floor or on your knees. You can have your knees and legs tucked in tightly as in a fetal position, or you can spread your thighs out in a vee. Make sure your arms stay stretched out. Close your eyes and breathe normally. You should start to feel a slight stretch in your back. This is a standard yoga move, done in every class. It’s a basic move that stretches the spine and back slowly but deliberately, vertebra by vertebra. The pose: Stand at the short edge of your mat. Bring your arms above your head and take a deep breath. Slightly bend your knees and slowly bend forward to the other end of the mat and plant your hands on the ground. Your body should look triangular, and you should feel a slight stretch in your back and spine. Hold for 20 seconds. Return to your standing position. Repeat as many times as you like. This yoga move is used in many aerobic and floor workout routines because it helps increase core strength and builds strong glutes. The pose: Lie down on your back. Bend your knees with feet flat on the ground about a shoulder-width apart and your arms at your sides. Squeeze your glutes, pushing through the heels to lift your body off the ground. You should now be resting on your shoulders. Hold for up to 15 seconds. Lower yourself to the ground. Repeat as many times as you like. Another classic yoga move, this one is great for stretching your abdominal muscles as well as your back. 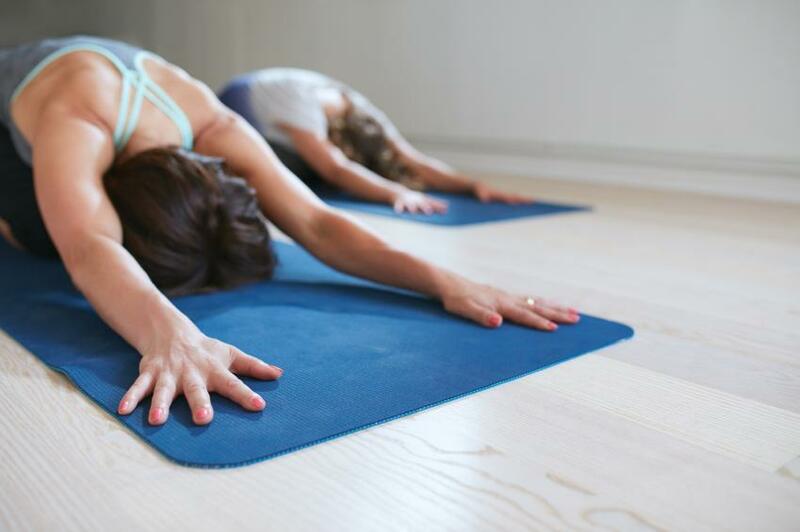 The pose: Lie flat on your mat face down with your hands under your shoulders. Lift the front of the body up off the mat, looking straight ahead. Keep your head lifted. Bring yourself up as far as you can go, then lower yourself back down. Repeat five times. A nice variation to this is to twist to the side when in the main pose. Twist to the right slowly, hold, return to the center, and then twist to the left gently. Please note that during pregnancy, yoga for sciatica doesn’t change much. Go at your own pace and pay attention to how your body feels. As your pregnancy progresses, discuss with your doctor if there are certain moves you should avoid. Many women are able to practice yoga into most of their pregnancy, but everyone is different, so listen to the cues your body gives you. Sometimes sciatic pain persists no matter how many proper stretches or sciatic nerve exercises you do. If this is the case, and if it interferes in your daily life for weeks on end or keeps coming back, then you should pay a visit to the doctor to make sure it isn’t something worse. Simple X-rays and even an MRI, if the doctor feels it is warranted, can help rule out more serious spinal issues such as a slipped disk. As with most things, prevention and catching an issue early on is easier than dealing with a major hurdle like surgery. Bowel and bladder control are problematic.